Get ready to manage a ragtag group as they traipse across a corpse-filled wasteland in March of the Living. It’s due to launch next Wednesday, April 20. Will it be good enough to join our list of best zombie games? 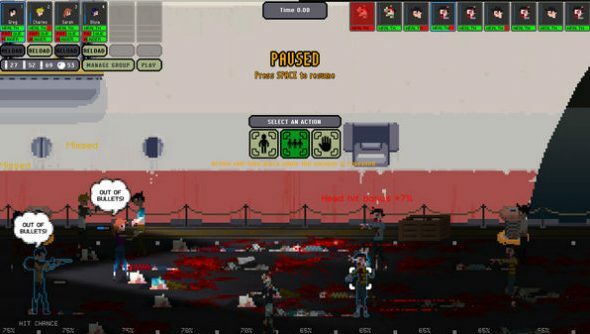 “Imagine FTL in the zombie apocalypse, that’s March of the Living in a nutshell,” says developer Dave Toulouse of Machine22. As someone who absolutely adores FTL, that claim does get me pretty pumped. Instead of jetting through space, though, here you’ll choose a main character and set off on a dangerous journey to the fabled safe zone, picking up friends, making enemies, and being faced with tough decisions as you go. “The world is crumbling and the dead are roaming, but a glimmer of hope remains,” says the blurb. “A safe place where humanity can start over, protected from the hell this world has become. This is your destination. Like FTL, it’s all procedural, with hundreds of events that could pop up at any time, forcing you to make a choice. You’ll have to trade, scavenge and fight to survive. Combat is real-time with the option to pause – yes, like a certain space roguelike. No price has been set, but you can add it to your Steam Wishlist now.